Is there anything nicer than making a loved one happy with a spontaneous gift? Not much, unless, perhaps, you have made the gift yourself! One thing is certain – between the original idea and the finished gift lie much thought, valuable time, and loving attention to detail. And that all adds up to much more than just a quickly purchased gift. Even if it’s always wonderful to give or receive a gift, at Christmas the question of the perfect gifts fill our thoughts. Cozy hand-knit REGIA socks are an absolute classic, that everyone loves to receive. What could be better than warm feet in beautiful socks? Often, the needles are hard at work for months in advance, to make sure that each loved one will receive a pair of hand-knit socks this year. And if your family includes someone with size 15 feet, you have your work cut out for you! That doesn’t leave much time to worry about the packaging. But everything that is so lovingly made deserves a special wrapping. You must (may!) 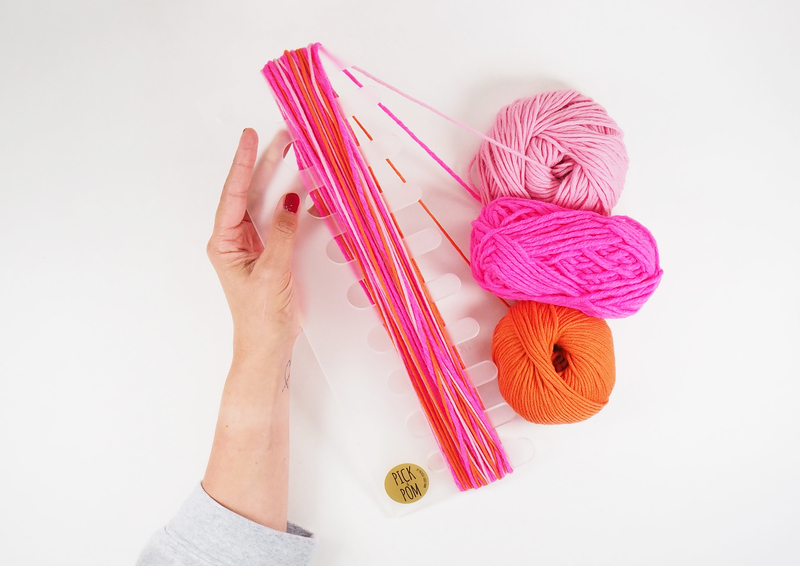 knit your gifts yourself but as far as gift-wrapping is concerned, we have collected several good ideas. These include suggestions for those with enough time to make something creative but also for last-minute gift-givers. 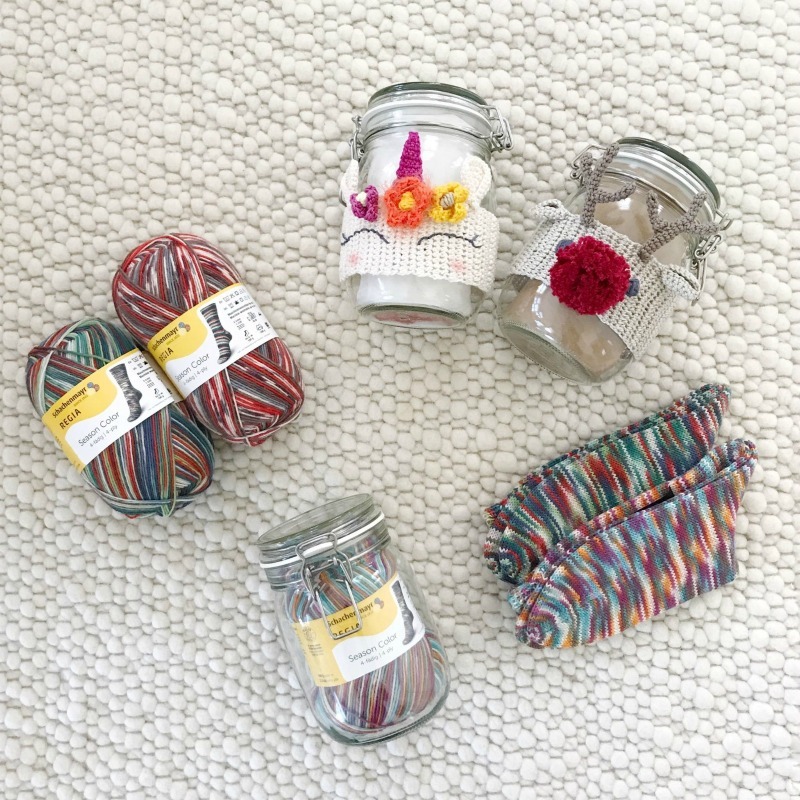 Sock knitters who also have a talent for crochet will love to make these wonderfully embellished canning jars. Choose between Rudolf the reindeer and a unicorn – the designs by Alexandra, also known as Sinchens_Strickenundhaekeln, are the perfect choice for Christmas but also for a birthday or as a hostess gift for a summer party. With a little imagination and skill you can also adapt them to create your own unique gift presentation, for any occasion. See the free crochet instructions here. Not fond of crochet? Don’t worry! 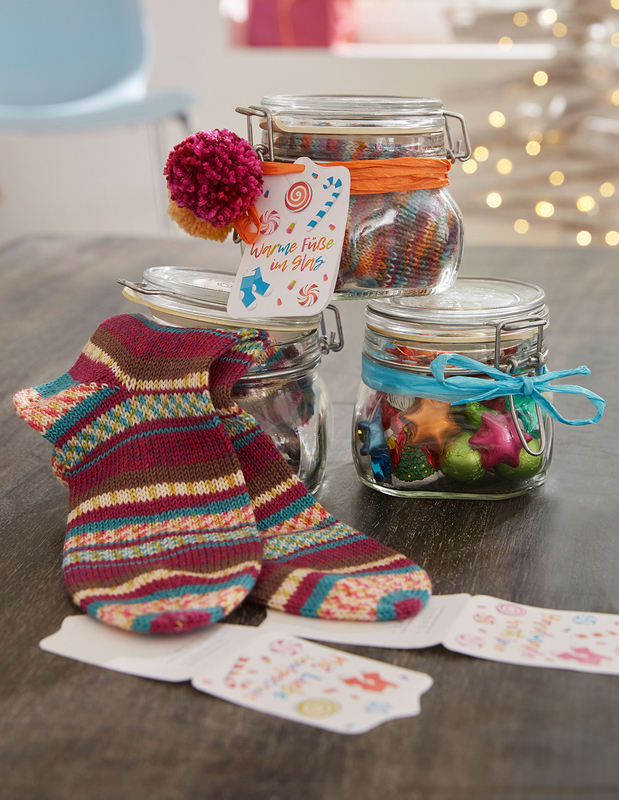 Warm socks in a jar still look lovely and can be quickly decorated with some pretty pompoms or tassels. Even if you are preparing gifts for all your family and friends, your own personal embellishments will be finished in a flash, with the help of our wonderful little tools, Pick&Pom and Tassel Maker – ideal for everyone who appreciates the special value of handmade gifts and wrappings. For everyone who loves scisssors, paper, and classic design, Alexandra from Sinchens_Strickenundhaekeln has designed a wonderful paper box with window, to show hand-knit socks to best advantage. Instructions for making the box can be found as a free download on her website. Once again, you can let your creativity run free when making your own version of this gift box – add bows, tassels, pompoms, and more. Everything goes! Are you more the “last-minute type” and just happy when you finish knitting a pair of socks in time? We know how that is so, of course, we haven’t forgotten you! 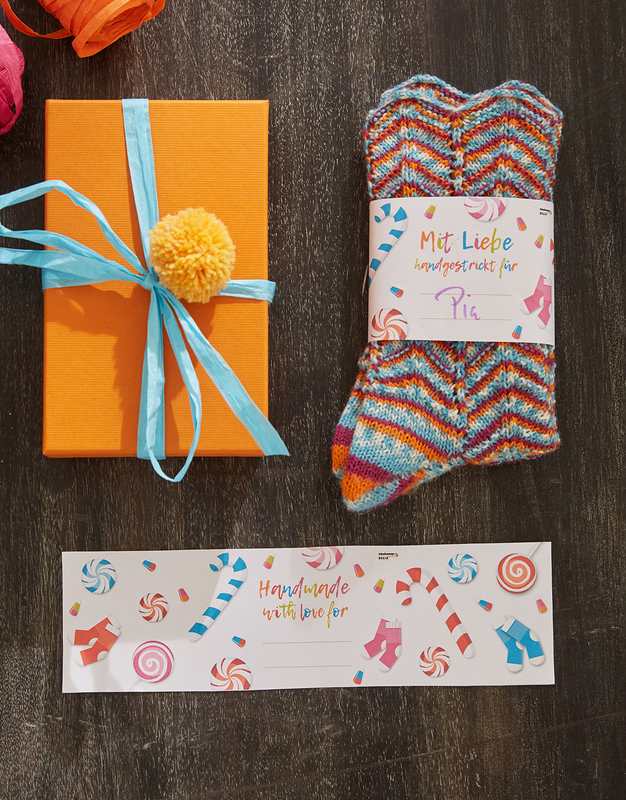 Get ready to turn your printer on because our free gift band and matching gift tags can be printed in no time at all. All you have to do is add a quick greeting – and everything is ready to go. And don’t forget, socks themselves also make fantastic packaging for small gifts and treats. 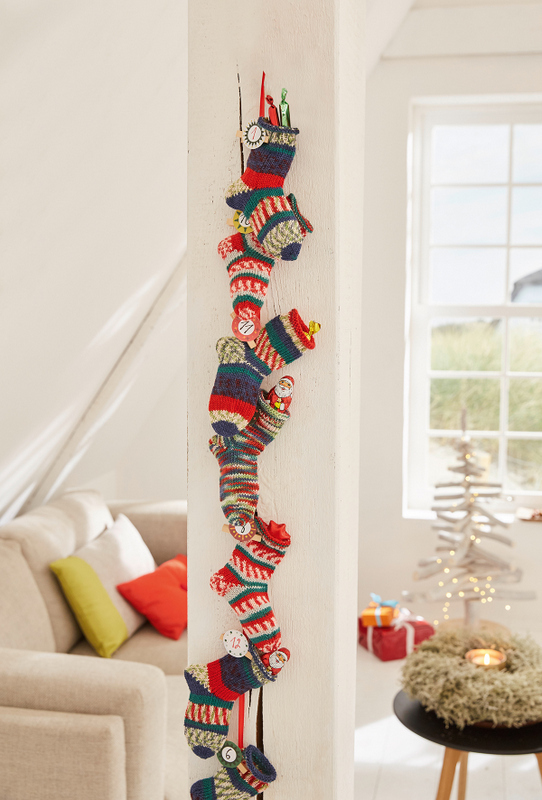 You can make a stocking for Santa to fill, place one under the tree yourself or knit enough to make a beautiful Advent calendar – the choice is yours. You can also print the numbers from 1 to 24 to quickly identify which day each sock is to be opened. Finally, we would like to show you three of our favorite REGIA socks designs, with the instructions available as free downloads. Knit them with REGIA Season Color yarn or with another 4-ply REGIA sock yarn of your choice. We wish you lots of joy while handcrafting, wrapping, and presenting!